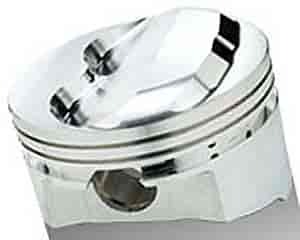 SRP SRP Dome Pistons for Small Block Chevy Bore 4.040"
SRP Small Block Chevy High Compression Forged Pistons are smooth flowing symmetrical dome for excellent flame propogation. Dome requires no de-burring or preparation. Designed for use in all common 23° heads. Non-silicon alloy for superior strength in high cylinder pressure applications. Symmetrical dome and valve reliefs for universal installation. .927'' x 2.750'' x .150'' straight wall carbon steel wristpin (130g) included. 1/16, 1/16, 3/16'' ring grooves.